The 2009 competition is open to fifth and sixth classes and will include 7 schools in Inishowen in Co. Donegal. What you have to do: - Design up to 3 pages for a road safety website or PowerPoint presentation, featuring your school’s name and your ideas to highlight the dangers on our roads. All the entries will be displayed on the PARC website with a link to all schools. A perpetual trophy will be presented to the overall winning school. 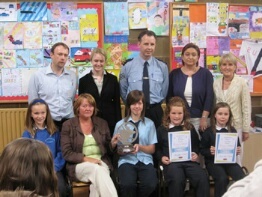 Last year 2008 the trophy was won by Aine Mc Laughlin 5th class Scoil Naomh Fionan, Whitecastle. To develop an increased awareness of road safety. To develop a sense of personal responsibility as a road user - as a pedestrian, a passenger, or a cyclist. To develop a sense of how road tragedies are rarely accidents. An awareness that we all have a role to play through not drinking alcohol and driving, or wearing your seat belt on the school bus or on the way home in the car. A recognition that road safety is something we provide for each other. The closing date for this competition is 31st May. 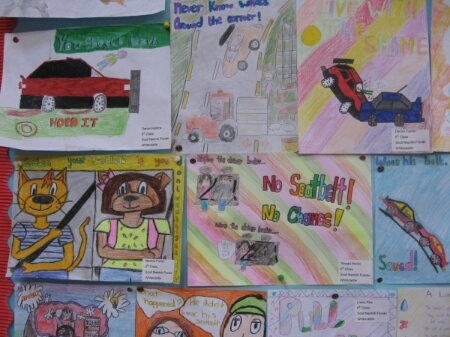 The Road Safety Authority, Donegal Road Safety Working Group, An Garda Siochana and PARC Road Safety Group will judge the entries in June and each school will be notified of this date in advance. The RSA has agreed to forward any necessary educational road safety booklets if required, to assist the teachers with their work.